Fonseca and Mealin were both denied podiums at Snetterton following unfortunate coming togethers in separate incidents, but Donington Park offers the pair another chance to ensure a strong end to the 2015 season. It will be Mealin and Bartholomew's first competitive visits to the circuit in a downforce car, but both have enjoyed positive tests recently. Mealin raced at Donington Park in Formula Ford, taking home three top 10 finishes and class podiums. Fonseca meanwhile claimed a strong haul of points at the Leicestershire circuit in F4 last season, ending the weekend with a top-five finish. 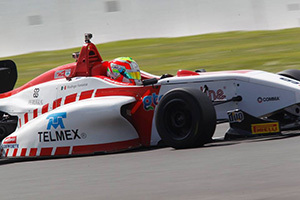 Fonseca, Mealin and Bartholomew race at Donington Park in rounds 19, 20 and 21 of the Duo BRDC Formula 4 Championship on 12-13 September.